The 2019 edition of NFPA 1600 will help you improve the odds for your community or organization in the face of a crisis. Learn what you need to know about disaster prevention, mitigation, preparedness, response, continuity, and recovery. 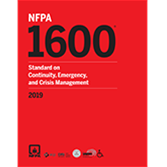 A new requirement to establish and maintain crisis management capabilities heads the list of major changes in the 2019 edition of NFPA 1600®, Standard on Continuity, Emergency, and Crisis Management. This standard is dedicated to helping users prepare for any type of crisis or disaster -- resulting from natural, human, or technological events. Widely used by public, non-profit, nongovernmental, and private entities on a local, regional, national, international, and global basis, NFPA 1600 continues to evolve as a vital standard for the development, implementation, assessment, and maintenance of disaster/emergency management and continuity of operations programs. Significant revisions in the 2019 edition reflect the needs of all types of companies and organizations today. The standard is reorganized for better alignment with the PDCA (plan-do-check-act) model or Deming Cycle. New requirements to establish and maintain crisis management capabilities include critical details regarding assigned responsibilities and processes. All-new Annex L on data interoperability for emergency management, continuity, and crisis management provides criteria for assessing your organization's needs and capabilities, to help you develop plans to fill any gaps. Numerous updated crosswalks and annexes reflect changes to the main body of the standard, for easier navigation and application. Get the most advanced tools and strategies for disaster prevention, mitigation, preparedness, response, continuity, and recovery. *The 2013, 2007, and 2010 editions of NFPA 1600 have been designated by DHS to be used by accredited 3rd parties, to evaluate and certify compliance of entities under its Private Sector Preparedness (PS Prep) Program. Interested in other editions of the NFPA 1600? Use the drop down menu above to select the edition year you need. 5.1 Planning and Design Process. 5.3 Business Impact Analysis (BIA). 6.5 Crisis Communications and Public Information. 6.6 Warning, Notifications, and Communications. 6.11 Employee Assistance and Support. 7.3 Plan Activation and Incident Action Plan. 7.4 Activate Incident Management System. 7.5 Ongoing Incident Management and Communications. 7.6 Documenting Incident Information, Decisions, and Actions. 7.8 Demobilize Resources and Termination. 8.3 Scope and Frequency of Instruction. 8.4 Incident Management System Training. 8.6 Regulatory and Program Requirements. 9.2 Exercise and Test Methodology. 9.3 Design of Exercises and Tests. 9.4 Exercise and Test Evaluation. Update your knowledge about disaster prevention, mitigation, preparedness, response, continuity, and recovery with NFPA 1600®. Be prepared for any type of crisis or disaster -- resulting from natural, human, or technological events -- with NFPA 1600, Standard on Disaster/Emergency Management and Business Continuity/Continuity of Operations Programs. Widely used by public, non-profit, nongovernmental, and private entities on a local, regional, national, international and global basis, NFPA 1600 continues to evolve as a vital guide for the development, implementation, assessment, and maintenance of disaster/emergency management and continuity of operations programs. Protect public safety and your business. Get criteria for prevention, mitigation, preparedness, response, continuity, and recovery. Changes throughout the 2016 edition reflect the Standard's new title, which was made to emphasize its broad applicability in all types of companies and organizations. Specific hazards -- geological, meteorological, biological, accidental human-caused, intentional human-caused, and technological -- are clarified to assist evaluation during the risk assessment required in Chapter 5: Planning. New sections on Continuity and Recovery in Chapter 6: Implementation expand information and make it easier to apply. A new self-assessment tool in Annex B helps you determine your level of compliance and target areas for improvement. New Annex J: Access and Functional Needs discusses the important roles each segment of a community has to assist people with disabilities. Other changes include a revised Plan-Do-Check-Act (PDCA) Cycle in Annex D; added crosswalk tables in Annex E; and major updates to Annex F: NFPA 1600, 2016 Edition as a Management System Standard (MSS). *The 2013, 2007 and 2010 editions of NFPA 1600 have been designated by DHS, to be used by accredited 3rd parties, to evaluate and certify compliance of entities under its Private Sector Preparedness (PS Prep) Program.